The Alvin Buenaventura-edited coffee-table book Modern Cartoonist: The Art Of Daniel Clowes (Abrams ComicArts) contains a lengthy Clowes interview alongside essays and appreciations—including articles by Ware and graphic designer Chip Kidd—all illustrated with copious samples of Clowes’ work. The text-pieces are well-chosen, and give a sense of where Clowes fits into the larger words of fine arts, cinema, and literature. Few cartoonists have been as adept as Clowes at using the frame of a comics panel to convey perspective, purposefully drawing the reader into the mind of a protagonist and then revealing that mind as more warped than it originally seems. And few have been as skilled at constructing narratives that pull the reader easily along, allowing Clowes the liberty to introduce elements of surrealism, post-modernism, social comment, and formal play without closing his work off from basic comprehensibility. Modern Cartoonist recognizes and sharply analyzes what Clowes has done to make him such a significant figure in the history of the medium. But the real selling point of Modern Cartoonist is the art, which, as laid out by Jonathan Bennett—himself an excellent cartoonist—captures the breadth of Clowes’ oeuvre, from the simplicity of his early strips to his recent books, which use a “Hey kids! Comics!” kind of grammar as an ironic juxtaposition to fairly grim plots and characters. Buenaventura and Bennett have gathered sketches, photos, original art, and some of Clowes’ own reference materials, and present them alongside panels, pages, and commercial art assignments, some of which have been little-seen even by die-hard Clowes fans. (Want to see the Christmas card Clowes sent out in 2006? Modern Cartoonist has it for you.) As assembled, all of these drawings tell their own story, about an artist who found his niche and then expanded it. It’s not the kind of story that Clowes himself would tell, but it’s an inspiring one. Rich Tommaso is one of the better Daniel Clowes-inspired cartoonists, and his Pete And Miriam: Book One (Boom! Town) is similar to some of Clowes’ recent books, in that it uses the form of classic kids’ comics to tell a story for and about adults. There are, however, kids in the book: the title characters, who’ve been friends since childhood, and are seen both in their grade-school days and in their 20s. Tommaso jumps back and forth in time, exploring how this pair’s lives and relationships have changed over the years. Pete goes through a punk phase and gets into film; Miriam becomes an artist, and watches Pete closely as he burns through opportunities and lovers. Both are influenced by an upbringing that saw them running wild in the suburbs, free to pursue their own interests. Book one of Pete And Miriam is weighted too much to the “Pete” side of the equation, and some of its digressions—especially Pete’s pursuit of an interview with one of sexploitation filmmaker Russ Meyer’s old collaborators—will likely seem less out-of-place when the whole story is complete. Yet even in this truncated form, Pete And Miriam is impressive in its scope: It’s reminiscent of one of Chris Ware’s intimate epics, examining ordinary life through a mosaic of moments, isolated from a longer and more tangled timeline. But Pete And Miriam isn’t merely derivative of its influences. The at times childlike framing devices suit two characters who haven’t yet fully grown up, and the time-jumping serves to connect the seemingly minor moments of the past with how Pete and Miriam behave now. Tommaso has been working on these comics off and on for years in between other projects. Here’s hoping the first collected volume does well enough to hasten a second. Because of the variety of work that Eddie Campbell has produced over the years—from offbeat adventure strips to whatever weirdness Alan Moore has asked him to draw—he’s not always mentioned in the same breath with the stalwarts of alt-cartooning, even though Campbell’s scratchy line and penchant for discursive comics-à-clef put him in the same class as the medium’s true iconoclasts. The Lovely Horrible Stuff (Top Shelf) is one of Campbell’s “here’s a little slice of my life” books, telling the story of how his father-in-law squandered a bundle of cash that Campbell loaned him, and contrasting that with a trip to the island of Yap to have a look at its famous giant stone coins. In between those adventures, Campbell talks about the recent financial crash, describes the accounting complications of being a freelance artist, and imagines what it would be like if William Shakespeare wrote letters to the people who owe Campbell money. As is usually the case with Campbell’s more personal projects, The Lovely Horrible Stuff wanders about from topic to topic, sometimes circling back to complete thoughts from earlier, and sometimes just letting those unfinished ideas dangle. But Campbell is always good company, even when he’s moving so fast that it’s hard to keep up with him. And in the flurry of asides about contracts, currency, and the way kids trade bubblegum cards, Campbell hits on something, having to do with what we cling to in our lives—some of which has actual value, and some of which we only presume to be worth something. It’s a cheerful lesson in what matters, delivered by an artist who has his own way of expressing his ideas, honed over decades of meaningful toil. Spain Rodriguez is one of the legends of the original underground comics wave, and he tells his own origin story in Cruisin’ With The Hound: The Life And Times Of Fred Tooté (Fantagraphics), a collection of short stories about coming of age in Buffalo in the ’50s and ’60s. 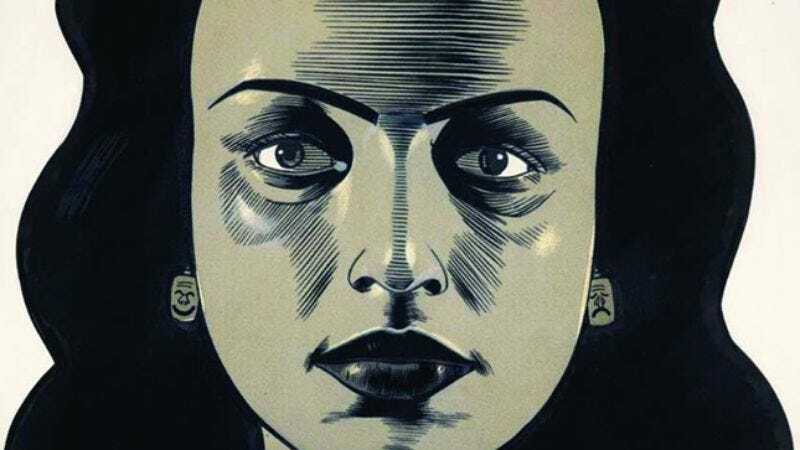 Rodriguez reports on his idle days and nights of philosophizing and woman-chasing with his buddies, and renders these anecdotes in his thick-lined, blocky style, reminiscent of the EC Comics he and his friends loved. The book also includes a Gary Groth interview with Rodriguez, putting these stories in context, but the layout of that interview—running beneath a few of the pieces on a small strip of the page—does a disservice both to the comics above and the word below. That’s about the only knock against Cruisin’ With The Hound, though, which otherwise gives a real flavor both of Rodriguez’s work—which was so different in its point of view than the other underground comics of the late ’60s and early ’70s—and from whence it came.